This is an image you can see often around PNG, except for one thing. The AudiBible on the rock nearby, placed faced down so it can charge. In the foreground you see coffee beans drying on a piece of metal roofing. I felt this image showed a good dichotomy of different ways the Sun can be used in PNG. 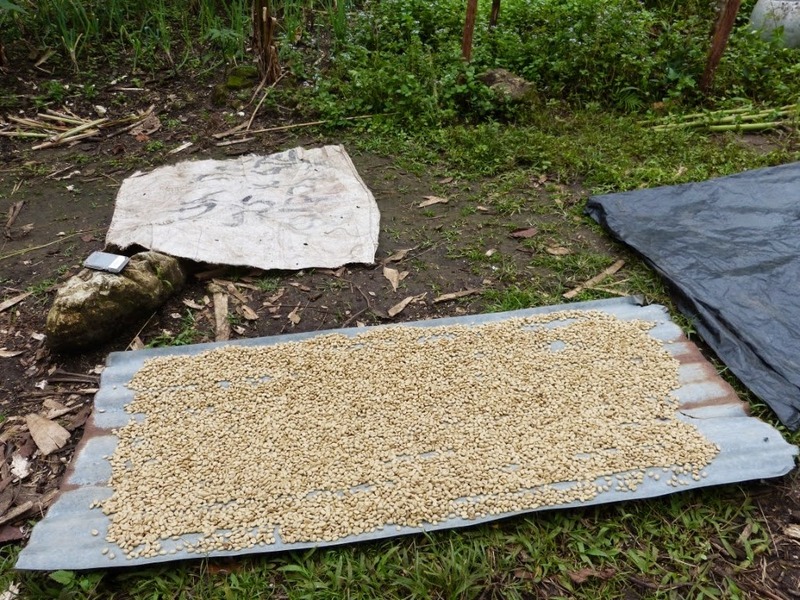 It's being used to dry these beans so the coffee can be sold and money can be made. The audiBible is being charged by the same Sun, so that they can listen to God's Word in their heart language. In this area, the families like to gather and listen to Scripture each evening for a little bit. In many ways it makes me think of the 'radio hour' when families during the depression era might gather around the radio to listen to their favorite programs. (ala Waltons). So, it is important to charge the unit daily, if you're to listen to it daily. I enjoy this picture.... because of the many comparisons you can draw from it. We have 3g available now! Unfortunately our five bars of cell reception dropped to a random 2 bars to no signal at all since the upgrade. Digicel PNG has upgraded the towers so now, we have 3g data, which is much faster than the EDGE. 7 years ago there was no Cell reception here. today you can get 3g, but reception is poor (has been for 3 weeks now) and we're hoping it is temporary. I predict in a few years time, we'll be almost caught up to U.S.A. circa 2001! I have featured this web site before on my blog. 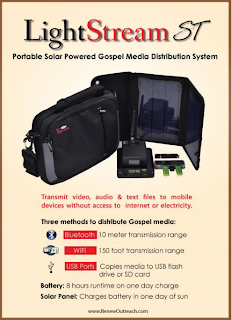 They create the portable projection 'Jesus Film' backpacks. But this setup is one that we've been eying for a while here in PNG. We could put entire audio Bibles on there, films, etc. Sure the actual download speed is rather slow right now.... but once someone gets a copy, it'll go viral in the village as they can transfer it from phone to phone. Many PNGians have cell phones, and often smart cell phones, capable of viewing video and playing audio. And so a nice little compact unit like this, that can distribute in a wide way... could be pretty awesome. Imagine, every air strip we sit and refuel at, broadcasting the good news of Christ in audio and video. Imagine every time we travel and stop for meetings, or picking up cargo, or transporting people to/from their destination.... there are always people sitting around, gawking, watching, doing little to nothing. Imagine those people having their phone beep them, and clicking 'yes' and then seeing or hearing God's Word in their language for the first time? It is an amazing concept, and one that I'm hopeful will become practical in the next 3 years or so. Right now, it's not super practical because of the realistic speeds of the transfer and how long we sit in one place. But we could work around that in so many ways. Anyway.. it's exciting, and it means a ton of work in compiling and gathering all the work we've done over the years, but thankfully, in the last 6 months I've been able to store most everything we've done on a local NAS device, so getting it all in one place, shouldn't be overly difficult.... just time consuming. But that leads me onto the next blog entry. Before I could get too upset, the machine beeped and he ushered me on. because of some threat I didn't know about. nitrates), one guy said hair conditioner made him come up positive. Still I was glad I wasn't strip searched. Growing up in a missionary culture, one of the big risks for christian kids is to see hypocrisy every time they look at adults. As a parent it has been my endeavor to approach my faith with Christ much more from the 'I do this because I love Christ, and I love Christ because of ........' and lay out that particular aspect of Christ for them. At the same time, they are children and need rules and boundaries. This video 'Beware of Christians' is not theologically deep, but I intend to show it to my teenage children soon. 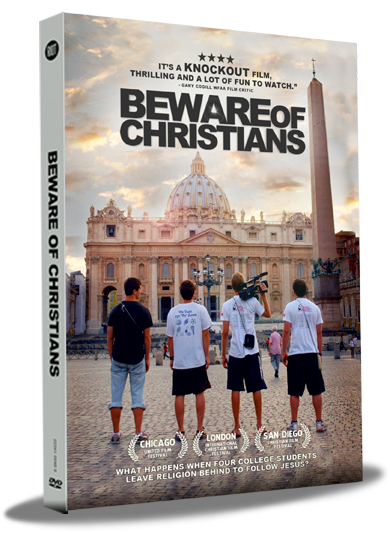 It follows 4 college age christian boys who attempt to do what the Bible says and not necessarily what they were taught in the church. They handle it respectfully, and sincerely. I wouldn't say this video would appeal to adults, but I think it may speak on a teen level. In the end they even bring up the 'all you have to do is say this little prayer to become a Christian' issue. This video is about young men, forcing themselves to think about, grapple with, actual real application of how they should be following Christ. I suspect it would engage teens at a conversational level, and even challenge them to gain a new perspective on things. a dark skinned man walked in asking if I wanted coffee or tea. "You laik coffee or tea boss?" and I replied "no thank you, are you from PNG?" nurses and roommate listened on having no idea what we were saying. so she could take lessons. said 'because he called me boss.'... (boh-ss). light in the world. It felt really nice. My apologies to everyone on our emailing list, because email is not yet functional. From the hospital our SIL secure ports are not allowed. I am currently in the hospital. I'm in Cairns, Australia and writing this from the hospital. I have been admitted for gall bladder removal. Let me tell you what the last week has been like. Monday morning, Kendal and I opened the doors to the house we're to move into (for those who have kept up on the Asection needing to move saga)... to the joinery department who began remodeling the kitchen. I'll blog post on that in a few minutes. Then we planned to next monday open the house to a painter. (for those following the 'getting paint') saga. On WEDS E.C. meetings began. This is why I haven't been blogging much, it's highly confidential and has been the major focus of my work hour time for the last 5 weeks. I'm the secretary and so I keep track of the documents, and such. Been far too busy to blog. Kendal has begun MAP testing in her new job. 5 days ago, I thought I had indigestion. Horrible pains shooting through my belly. I toughed it out that night but in the morning, at my wife's suggestion, I called the clinic. They first checked for bowel obstruction, or ulcer. Gave me some meds... didn't help. I was back the next day. An ultrasound showed them a really cranky gall bladder. 5 days now, pain, no eating, etc... and they medivac'd me to Cairns, Private hospital in Australia. We had to run around to stop all our super busy plans (okay Kendal did, I was on a clinic gurney), but by day 4 the pain had stopped, mostly because I wasn't eating. Our kids are in one of the children's homes, so they have a dozen other brothers and sisters keeping them company, my son is playing foosball, my daughter is socializing with older kids. They're both sad that I'm gone, but it'll be a good experience for them, I'm hoping. Meanwhile, I'm seeing this whole thing as a ton of first experiences. First medivac for me, first ambulance ride, first I.V. first wheelchairing around, first surgery. I think the lack of fear or pain has freed me up to be more inquisitive. Doctors have all the coolest toys. After 4 days of being in pain, being in a hospital in a 1st world country is extremely reassuring. But I can tell you this, the people in Ukarumpa are awesome. It took about 3 dozen people to get me here. People had to register for visas, fill out paperwork, make proper diagnosis, etc. And the doctors there pray over you. I've felt so incredibly cared for this entire experience thus far, that I can't help but have a good attitude. All our other plans, came to a screeching halt.... and our biggest concern now, isn't money (because God has always proven faithful through our support team) but it's that the surgery goes well and we can get back to the kids in a timely fashion.